The Black Diamond Mesa 2-Person Tent is a versatile shelter that has proven to be a good all-rounder for 2 people. It's well suited for your one or two-person backpacking adventures, or for the car camper. The Mesa is a lightweight yet roomy shelter with plenty of length for adventurers on the taller side. It's large head height of 44 inches accommodates that. It performs really well in wind and rain, with its vestibule staying dry and well ventilated. It is made of strong material, and while there are lighter options available to be sure, it's a strong contender as a 2-person backpacking tent. The Mesa has simple and effective design that’s easy enough for any user to set up. The tent is pitched from the inner first with two poles running through the center hub to each corner and the other pole sits at the top across the width (complete unit) then the inner attaches to the pole clips etc. Setting up a double wall tent doesn’t get much easier than this. A user can switch over to pitching this shelter without the inner section by using the fly sheet and poles that makes it similar to a tarp shelter. 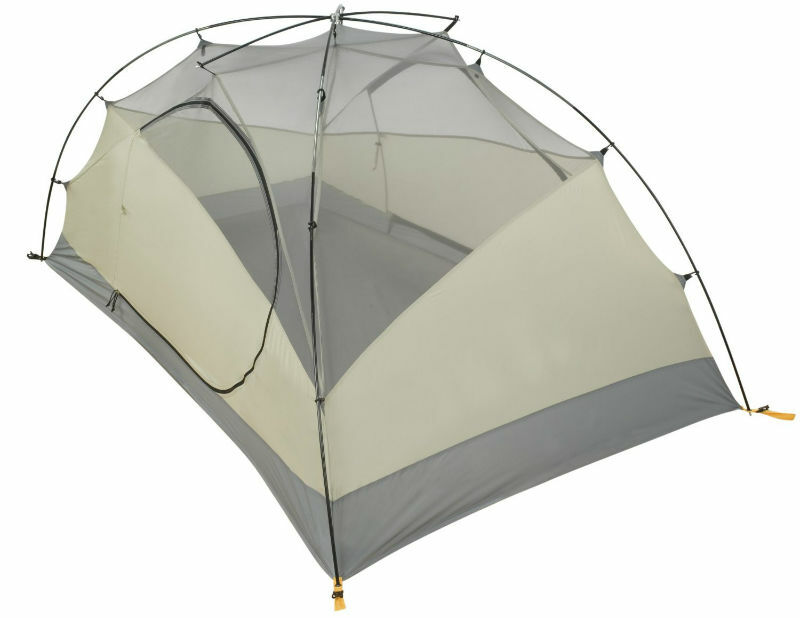 A buyer will need to provide a foot print for using it without the inner tent. For those of you who are looking for a roomy dependable and lightweight tent that will accommodate those adventurers over 6 feet tall you couldn’t do much better than the Black Diamond Mesa tent. The Mesa has a great weight to space ratio. Many other 2 man tents that are used for backpacking are lighter and pack smaller, however, finding a tent that can balance weight and space while offering a strong structure is hard to find which is what the Mesa excels in. The steep walls have been designed to provide that extra bit of well needed shoulder space when sitting up. Having two entrance doors is favored by many of us. I like how this gives each user their own separate section for sleeping and gear whilst making it very easy for access in and out without disturbing a partner. Some buyers may find the vestibules are slightly smaller than they would like for storing gear. However, the room inside the tent will provide space for minimal gear which some of us prefer rather than plenty of vestibule space. The vestibule issue is likely to be more about personal preference than anything to do with poor design. The Mesa withstands most 3 season weather conditions and performs well in early spring and the late of fall. Many users have withstood heavy rain, high winds and snow using this shelter which is not uncommon for BD tents. The materials used and the durability of this shelters design makes it close to becoming a four season while having the ability to vent well in hotter climates. If a user camps out in hot weather and needs plenty of ventilation the Mesa can be used without the fly sheet or it works just fine when keeping the vestibules open to improve air flow. The inner tent is meshed at the top which also allows good air circulation between the inner and outer parts of the tent. 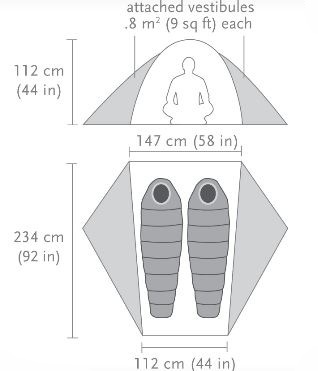 When divided between your backpack and that of your traveling companion this tent is as light to carry as most one man tents but, provides a bit more room and a couple of small vestibules for storing your gear. The total weight to carry for each person would be just under 3lbs which is a hell of a lot for the ultralight enthusiasts. But, for those needing the room and durability the Mesa offers when planning an extended trip the weight versus other factors may work in favour for this shelter. The Mesa is designed more for extended backpacking trips rather than a couple of days. 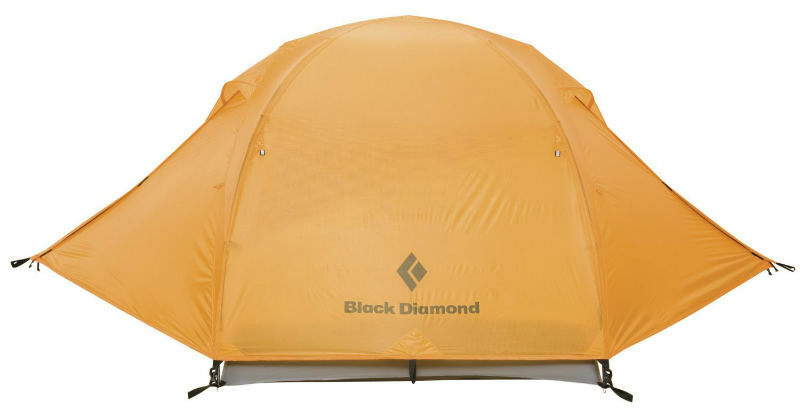 For those that travel light for a couple of days or so in fair weather conditions I would say this Black Diamond tent may not be needed. Other slightly cheaper tents that are lighter weighing around 3lbs could be worth taking a look at. On extended trips durability is a must alongside having a shelter that can work well in conditions that vary from day to day, or day to night. Durability has probably been covered well enough in this article so far, however I will a couple of important points. The poles are DAC featherlite which is a strong material that offers a good weight to strength ratio and the hub design seems to tie in well with offering more durability. To take care of the nylon floor a buyer would need to purchase the footprint (or ground cloth, as Black Diamond calls theirs) which of course will add little more cost to the overall price and some more weight. Strength and sturdiness is what BD does well with most, if not all of its tents which includes the Mesa. They’re built to last! While the price (over $300) may be a little steep for the occasional car camper, for those who do a lot of camping in various kinds of weather condition’s this tent will provide you with the reliable shelter you want and need. Like all Black diamond tents the Mesa is designed to provide an optimal shelter for those who prefer to combine hiking, climbing or any other activities with camping. For lightweight packers it could be a bit too much on the heavy side unless the durability and extra room is necessary. The Black Diamond Mesa tent is described by many as a good all-rounder that I’m in total agreement with. It’s ability to endure the best and worst of the 3 seasons while still being stowed easily in the pack gets it a big thumbs up from us. Packed Weight 5 lbs. 2 oz.